Witness the action at positive and negative altitudes as predators from above and below hunt millions of sardines off the coast of Africa. On the east coast of South Africa, one of the world's most extraordinary marine events is occurring. 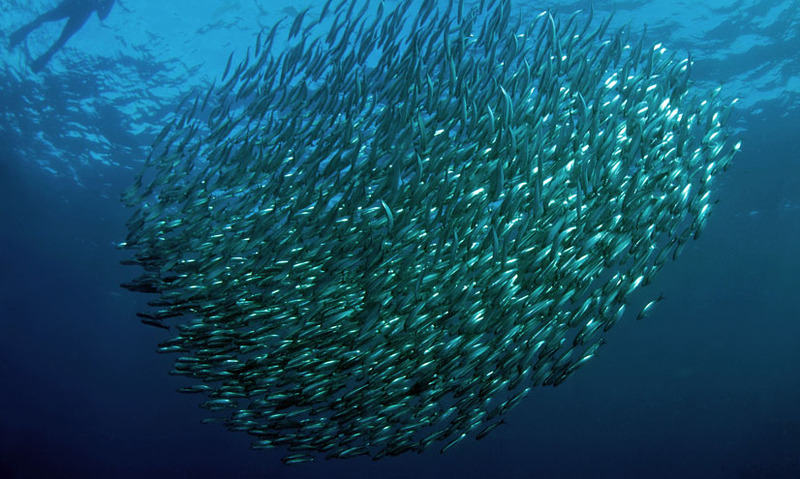 During the sardine run, millions of sardines migrate over thousands of kilometres. And they are followed by tens of thousands of predators, from altitudes above, and below. Altitudes are distances, typically measuring height above or below sea level. Above sea level, altitudes have a positive value. Below zero, they are expressed as negative numbers. The value of the number gives an indication of the distance from zero. The positive or negative symbol indicates the direction. In open waters, sardines swim at altitudes around negative 100 metres. So they are 100 metres below the surface. 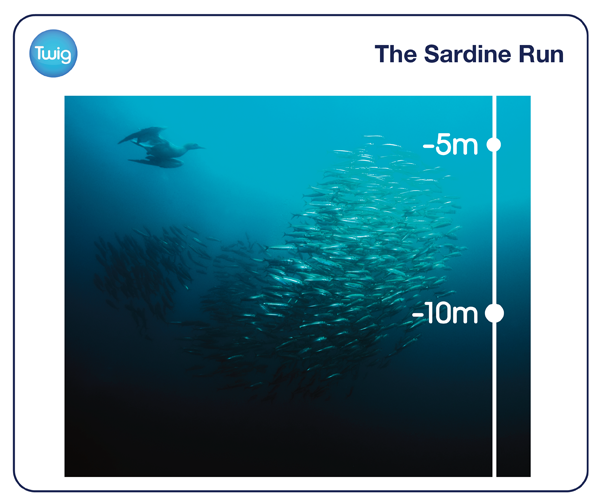 As the sardines swim towards the coast, ocean currents force them 65m upwards to around negative 35 metres. This puts them within range of the common dolphin, which typically dives to around negative 45 metres. But the dolphins prefer to feed near the surface. The pods swim up from below the shoals of sardines, herding them into groups called bait balls at around negative 10 metres. Now only a few metres below sea level, the sardines have become vulnerable to another predator. Gannets circle overhead, waiting for their chance to strike. Diving from as high as 30 metres, they can plunge 38 metres into the water at speeds of around 100 kilometres an hour. This allows them to reach sardines at altitudes as low as negative 8 metres. The feeding frenzy ends as the bait ball breaks up. But the sardine run will only end when the shoals reach the safety of deeper waters.